Ninety-six per cent of the universe is missing. The effects of homeopathy don’t go away under rigorous scientific conditions. The laws of nature aren’t what they used to be. Thirty years on, no one has an explanation for a seemingly intelligent signal received from outer space. The US Department of Energy is re-examining cold fusion because the experimental evidence seems too solid to ignore. The placebo effect is put to work in medicine while doctors can’t agree whether it even exists.In an age when science is supposed to be king, scientists are beset by experimental results they simply can’t explain. But, if the past is anything to go by, these anomalies contain the seeds of future revolutions. While taking readers on an entertaining tour d’horizon of the strangest of scientific findings – involving everything from our lack of free will to Martian methane that offers new evidence of life on the planet – Michael Brooks argues that the things we don’t understand are the key to what we are about to discover.This mind-boggling but entirely accessible survey of the outer limits of human knowledge is based on a short article by Michael Brooks for New Scientist magazine. 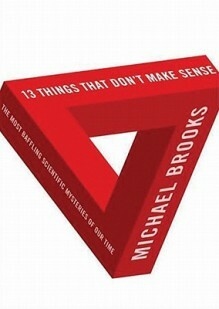 It became the sixth most circulated story on the internet in 2005, and provoked widespread comment and compliments (Google “13 things that do not make sense” to see).Michael Brooks has now dug deeply into those mysteries, with extraordinary results.